Learn to ride or refine your skills! Book early last year we sold out. 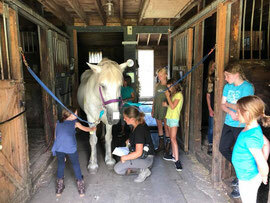 We offer a fun and exciting Summer Clinic that teaches children how to care for horses while learning to ride. Our instructors and staff are experienced in teaching young riders in a stress free safe & effective manner. Our horses and ponies are confidence-builders and are best suited for beginner and intermediate riders. * No prior horse experience is necessary. remaining $150 is due 2 weeks prior to your first day of clinic. 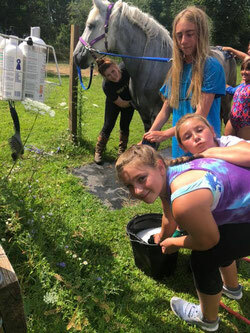 Riding, Grooming, Horse Care, Safety, and More. Be prepared for summer camp this year with your own gear! Click HERE to order your own new rider essentials from Smartpak. Owned and operated by horse professionals, Wind Crest Horse Farm is a great place to board your horse & learn the ropes!